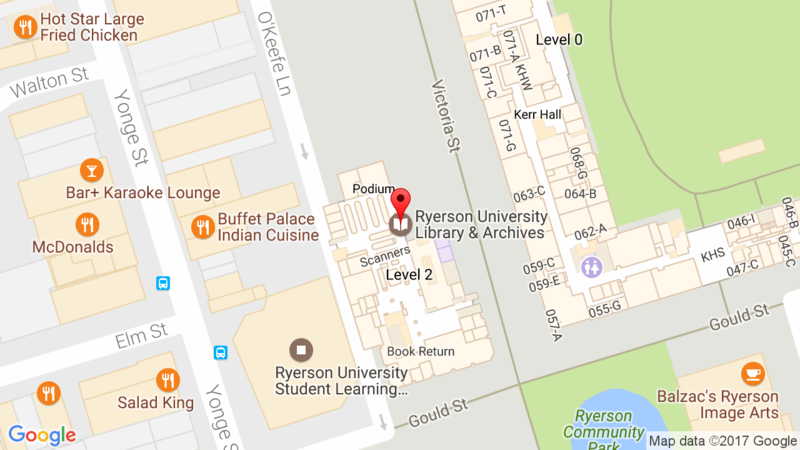 New to Ryerson? Navigating an academic library can be confusing but help is available! Here are tips to help you get started! Library resources are spread across 9 floors. Get started by finding the Library! The main floor of the Library is on the 2nd floor of the Library building. From there, you can take the stairs or elevator up to floors 3-9. Included in the Library is a renovated quiet study space on the 4th floor, the Ryerson Archives & Special Collections, and the sun soaked 8th floor. Feel free to explore on your own or book a tour. Online. Online. Connect to online resources from the Library website. From the Library website, you can connect to online resources and learn more about the services we offer. You can also chat with Library staff, book a study room, and stream over 20,000 films. Your OneCard is your Library card. Undergrads and grad students borrow using their OneCard. You also use your OneCard to pay for printing in the Library. Chang School students can learn more about borrowing on our website. The best way to start a search for a book (or any Library resource) is on the RULA homepage. From the home page, enter the information you have about the book. If the item is available, note the floor and call number – that’s how you’ll find the book. If the title is an eBook or electronic journal, click the link and you’ll be prompted to login to myRyerson. This book is available online. Click the link to access the book. Note the floor (2nd) and call number (BF 121 .P827 2017) to find books in person. The Library is so much more than books. Unexpected things you can borrow from the Library include board games, calculators, and cutting mats. We also have laptops for 4-hour loan and equipment like DSLR cameras for 48-hour loan. To borrow a laptop or DME equipment, fill out the online form before the first time you need the borrow. Feel free to ask staff for help anytime. We’re available by phone, online, and in person. This entry was posted in News by Winnie. Bookmark the permalink.